Nokia 3 vs Nokia 5 vs Nokia 6 - How do they differ? Nokia 3 vs Nokia 5 vs Nokia 6 – How do they differ? Thousands of Nokia fans were watching the live stream while the Nokia phones were being unfolded yesterday. As expected, HMD Global announced 3 Nokia-branded phones for global markets. 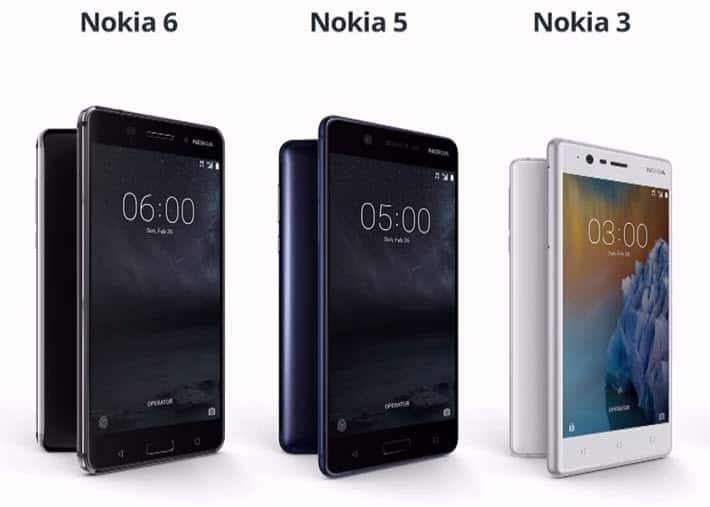 These are the Nokia 3, Nokia 5 and Nokia 6. Now, all the three devices cater to different use cases and hence target a different price point. In this story, we are comparing the three devices from a specs perspective to find out what suits whom. 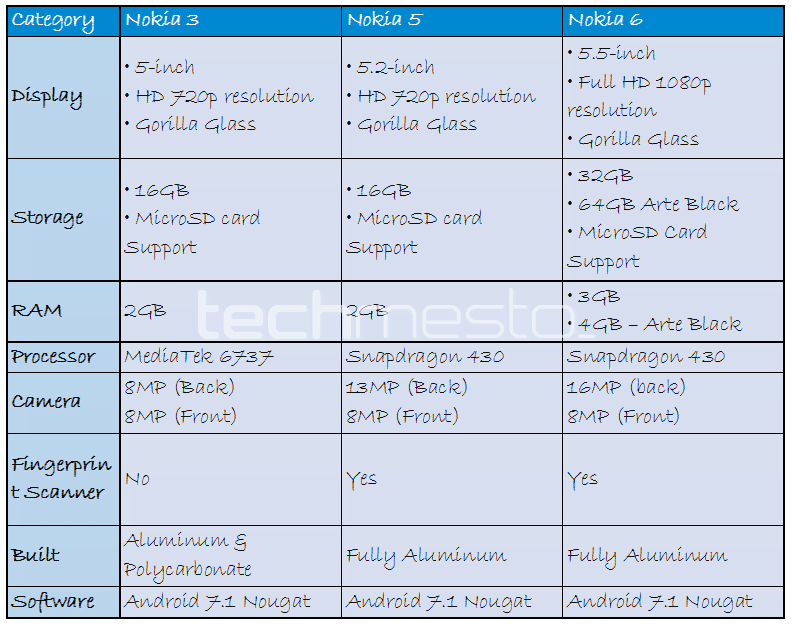 The table in the image below compares the Nokia 6, Nokia 5 and Nokia 3 side-by-side. Go through it to understand how and in what way do they differ from one another. As it is already evident from the naming, the Nokia 3 is the weakest of the 3 siblings, but it is also the cheapest. The Nokia 6 offers the best hardware out of the three and it also costs the highest. The Nokia 5 does a balance between the Nokia 3 and Nokia 6. Hence, the price also falls in between the other two. Let’s take a closer look at what different each of these phones offer. All of the three devices feature an LCD display. The size and pixel density increases as you go up by the order of their numbering. The Nokia 6 offers the best & the largest 5.5-inch display with a resolution of 1920 x 1080 pixels and a PPI of 403. The Nokia 5 comes in second with a 5.2-inch 1280 x 720 display and lowered down PPI of 282. The budget-centric Nokia 3 offers a 5-inch 1280 x 1080 display and a PPI of 284. 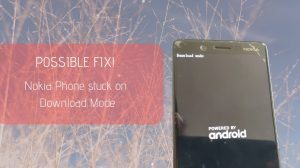 Display wise, the Nokia 5 appears to be the weakest. That’s because it comes with a larger display than the Nokia 3 and packs slightly lesser pixels per inch. From the hardware perspective, both Nokia 5 and Nokia 6 use the same SOC. Both devices are powered by the Snapdragon 425 chipset. And that’s all the similarity between the two. The Nokia 6 comes with 32GB of storage coupled with 3GB of RAM (and a limited edition 64GB & 4GB RAM variant called the Arte Black). Nokia 3 comes with an unexpected Mediatek 6737 chipset. The Nokia 5 and Nokia 3 offer 16GB of internal storage with 2GB of RAM. However, there is a MicroSD card slot to expand the storage upto 128GB. All devices offer 3.5mm headphone jack, Micro-USB port. Fingerprint scanner, however, is only included with the Nokia 5 and Nokia 6. The three devices offer reasonably good camera combination for the price they are targeting. The best camera is offered on the Nokia 6. It has a 16-megapixel primary (back) camera with pdaf, f/2.0 lens and a dual-tone LED flash. All devices provide a similar 8MP front (selfie) camera with autofocus and a wide-angle lens to capture a wider shot. None of three devices has a dedicated camera key to click images more easily, but that’s something we rarely see these days. Better hardware has its price, that’s why Nokia 6 will cost you nearly twice of Nokia 3. Nokia 6 is priced at €229 (~US $243), however, the Arte Black ‘limited edition’ is dearer at €299 (~US $243). 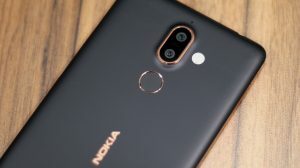 The Nokia 5 and Nokia 3 cost €189 and €139 respectively. The pricing does make these phones feel slightly overpriced. But if Nokia provides a decent level of support and after-sales services, the extra price might be worth it.